Cathy's Cuppa: Tea kettles and Teapots - which one to get? When I broke the captive lid-tab off of the lid of my previous teapot, I started doing research. What was I looking for in a water-heating method? It must be made from inert materials. This is non-negotiable. I will be heating water in it, nearly to the boiling point in it, every single day, sometimes more than once. So: Stainless steel, glass, or ceramic. A small amount of silicone is acceptable. In other words, NO PLASTIC. Yeah, yeah, there are food-safe plastics ... Maybe. It seems like every year or two, the news reports that yet another compound in plastic has been found to be harmful. So, I try never use plastic with hot foods or beverages. I use plastic all the time for cold or room-temperature foods, but not hot ones. This makes finding a good travel mug difficult, but so be it. It also means that even as tasty as the coffee that comes from an Aeropress is, it will never be my every-day coffee brewer. The lid has a built-in thermometer!! The thermometer has a dangly bit inside that drops the sensor into the water itself. This almost sold me on the Stagg, even though as a stove-top model, I'd have to pay attention (with the microwave, after some experimentation, I just set the timer and walk away - then fetch it when it dings). I'd also have to store it - and I have enough items that live on the stove already. Not my desired method. And... the lid is plastic. I've heard rumors that they are working on a metal lid, but it's currently plastic. Not my cup of tea (ahem). So, between it being a stove-top model and having a plastic lid, I decided not to get it. I emailed them to ask for an electric version (much easier to store than a stove-top model), preferably with variable temperature control, and they said they are thinking about doing something like that. Cool. 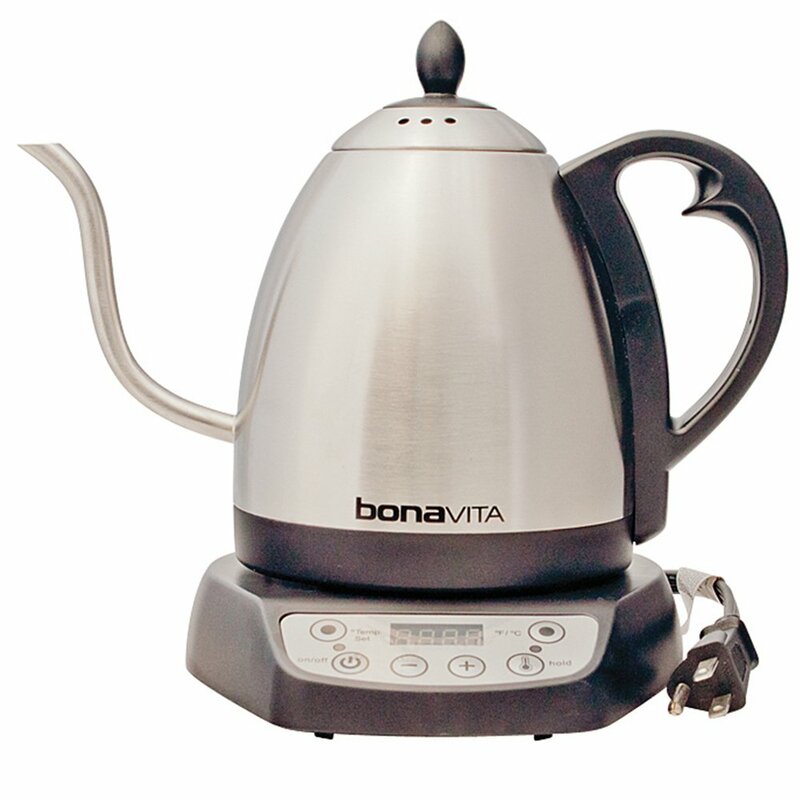 It's widely considered the best of the electric tea kettles, and I had an opportunity to use one at a friend's house, and it's really is pretty great. Spout is good, and gives excellent control over the pour. The temperature controller is super easy to use. It heats water very quickly. The problem? The handle is plastic. That's fine on the outside of the kettle, but where it pierces the metal body to bolt on - there's a lump of plastic inside, near the top of the kettle. Steam and condensation will allow plastic to touch water. I haven't found any other tea kettle with absolutely no plastic inside. So, I I decided I'll wait for an electric all-metal version of the Stagg, and in the meantime, I'll continue using a ceramic teapot.